Smartly invest in your food. Taking the time to scope out good variety and higher quality reflects in your dishes, and can even be the basis for inspiration. I took this photo at Eli's - an Upper East grocer with a pretty vast selection of produce, cheeses and all kinds of things. 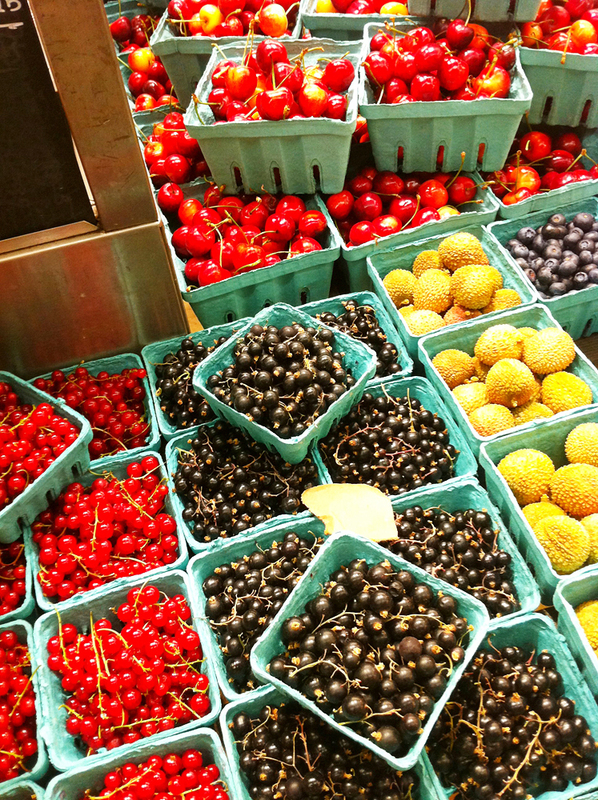 The next day, Jen and I were in the store and she was literally awed when she was standing in the same exact location I took the shot from - the fresh and colorful currants, lychee, blueberries and Rainier cherries. Whole Foods can be good but try other venues - fresh markets and grocers who carry local produce. Feel, smell, even taste the produce - different seasons yield different flavors so in the summer fruits taste different than winter. Try baby lettuces, heritage tomatoes, and anything else that is out of the ordinary - taking the time to make one aspect of a dish different goes a long way. Congrats on starting your blog! Photos of your cooking has had my mouth watering for years. So glad you started this blog, now I can finally learn how you whip up such yummy masterpieces. Would love it if you threw in some favorite go to recipes that are quick to whip up for us not so fabulous cooks! And yikes, I thought my husband was sweet, you cook gourmet meals for your wife and you name a site after her, talk about love!